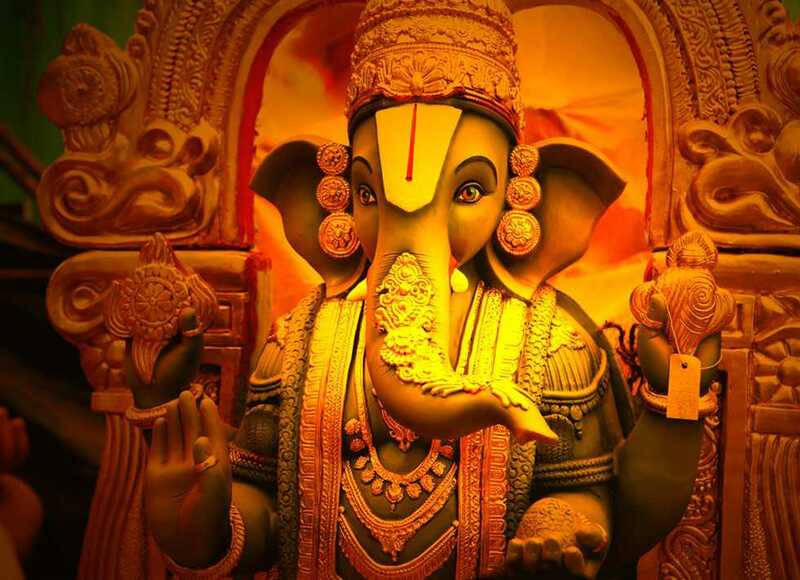 Ganapati who is also referred to as Ganesa (Chief of Shiva’s army), Vigneswara (He who removes obstacles), Gaja Mukha (Elephant faced God), Eka Dantha (God with one tusk), Lambodhara (God with a big Paunch) etc is one of the very important Gods of the Hindu pantheon. He is endearingly called Pillayar (our son) in Tamil Nadu. One day when Lord Shiva was away, Goddess Parvati wanted to take bath in the river. To guard against any unwelcome intrusion, she took a little turmeric paste from her body and created a young boy. She gave him clear instructions not to allow anybody inside. Unfortunately at this time Lord Shiva returned. The new boy refused him admission, though lord Shiva told him that he is the husband of Parvati. Lord Shiva became very angry and cut off the head of this new boy and threw it away using his trident. At this time, Goddess Parvati came back and became very sad, that the boy created by her was killed. Lord Shiva wanted to console Parvati. So he sent his army to bring the first head that that they see on their way. The first head that they saw was the head of dying elephant. Shiva fixed that head on the boy’s trunk and brought him back to life. He also adopted him as his elder son and made him chief of his army. Yet another story tells that Goddess Parvati wanted a son badly and did Tapas to Lord Vishnu. He blessed her and a son was born to her. Goddess Parvati invited all Gods to come and see her baby. When Lord Sani (Planet Saturn) came and had a look at the baby, the baby’s head was burnt. Lord Vishnu traveled throughout the world and brought back a head of an elephant which was fixed to the baby. All Gods present there blessed the baby, that unless he is worshipped first, they would not accept any worship. Yet another story is that of Gajamukhasura. Gajamukhasura did great penance toward Lord Shiva. When he came before, he requested Lord Shiva to live in his belly. When Lord Shiva did not return, Goddess Parvati sought the help of Lord Vishnu. Lord Vishnu dressed himself as a flutist and took along with him Nandi, the steed of Lord Shiva, Nandi was made to dancefunny dances, in front of Gajamukhasura to the soulful musicprovided by Lord Vishnu (This type of bull dancing to the tune of music is still prevalent in South India).Gajamukhasura was pleased and gave a boon to Lord Vishnu, without knowing him who he is. Lord Vishnu requested him to release Lord Shiva. When Lord Shiva came out of his belly the asura died. While dying he requested Lord Shiva, that his head should be remembered after he is dead. After his death, Lord Shiva fixed the asura’s head on his elder son. The most popular story as to how Ganapati lost his tusk is as follows. Veda Vyasa decided to compose the huge epicMahabharata. He needed some body to write down his composition, as soon as he composes it. 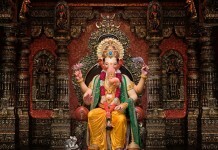 Ganapati, being the God of knowledge, was requested to do this job. 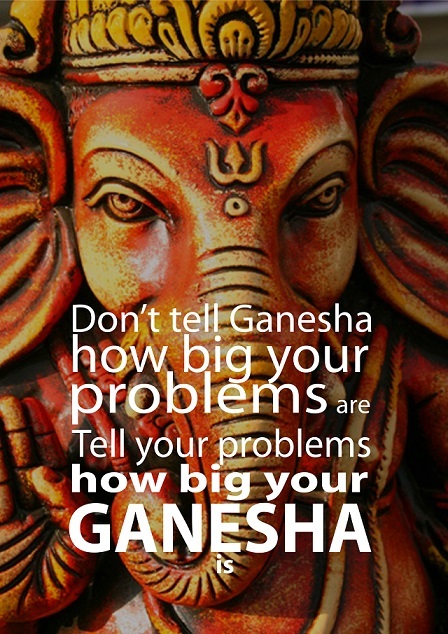 Ganapati agreed on one condition. Veda Vyasa should dictate all he wants to write at one stretch and without break. 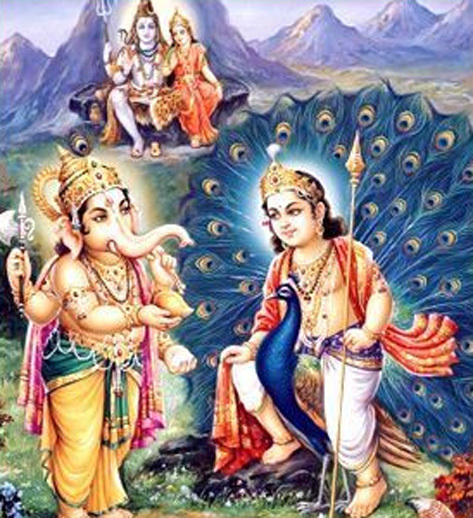 Vyasa agreed but he put a condition that Lord Ganapati should write a verse only after understanding it. After agreeing to this Ganapati broke one of his tusks and used it as a pen. Veda Vyasa composed extremely difficult to understand verses, whenever he wanted time to think. This was the reason why Ganapati become the one tusked God. 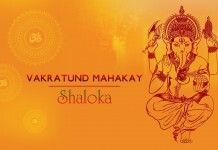 Another story says that, there was a need for Shiva to appoint a commander and the above competition was held and Ganapati won the post as explained in the last paragraph and was nominated as Ganesa or Ganapati(Both meaning the Lord of Shiva’s army) and later Lord Subramanya was appointed as the captain of the army of devas. The marriage of Shiva and Parvati was to be celebrated on mount Kailasa. All the people all over the world started traveling towards mount Kailasa. Due to the heavy burden on the northern side, the world started tilting towards the north. To correct this Lord Shiva requested sage Agsthya to go and live in the South of India. Agasthya obeyed the orders of Lord Shiva and reached the south. The entire south India was extremely dry at that time. Lord Shiva had sent some sacred waters of Ganga along with Agasthya, which Sage Agasthya was preserving very carefully in his pot. One day when was asleep, Ganapati took the form of a crow and toppled Agasthya’s pot. From the Ganga started spreading in to a river. This river was called “kaveri”- She who was spread by a crow. Subrahmanya during his travels in south fell in love with Valli who was a tribal princess. Though Valli loved Lord Subrahmanya she was scared of him, her being a simple tribal girl and he being the celestial God. 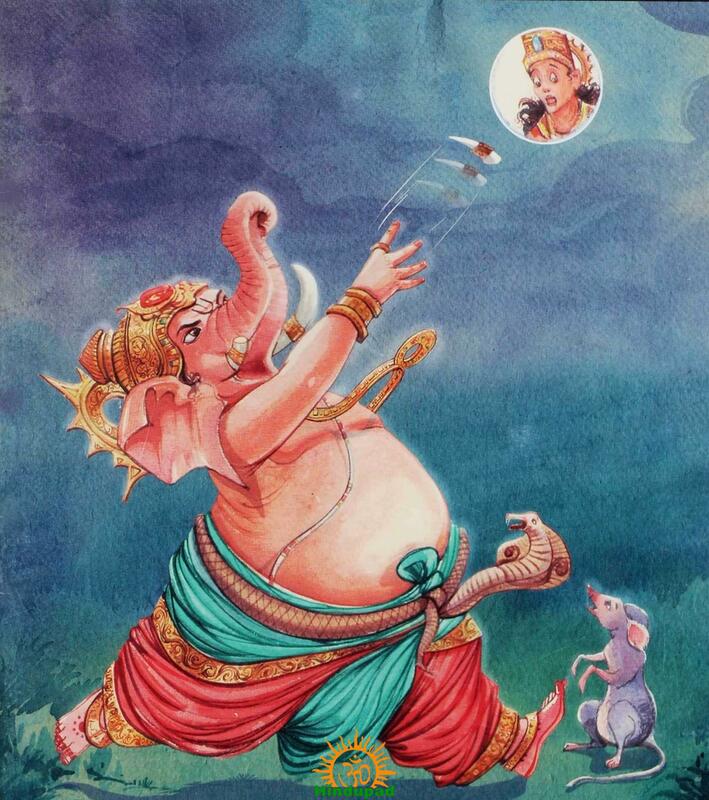 One day while Valli was walking in the forest, Lord Ganapati took the form of an wild elephant and chased Valli. Subrahmanya in the form of an ordinary man gave her protection and the elephant to go away. Then Lord Subrahmanya showed his real form and both of them got married. 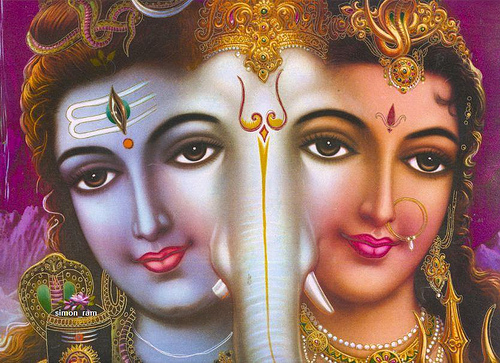 Previous articleSymbolism Of Ganesha – What Does It Indicates?